Offering you a complete choice of products which include worm wheels. We manufacture Worm Wheel for gearboxes. 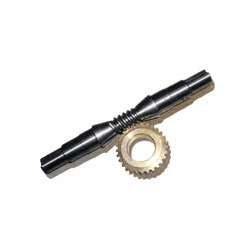 Gearbox contains in major worm wheel & shaft with bearing and the seal.Due to continuous work load the wheel gets worn out and changing the whole gear box cannot be cost effective. We can manufacture the same by having the design, torque and if required we can visit your site and take the required dimensions.